HAPPY NEW FINANCIAL YEAR Friends!!! We hope all of you had a lovely previous financial year. We are sure all the investments you did in the previous financial year reaped laurels for you. Well than you need to go through this article so you can better plan your finances this Financial New Year. Today is an excellent day. Not only has the Financial New Year started, but also today is the first day of Indian New Year and also the first day of Navratri. So let’s take a pledge today, that we will follow good investment strategies and also put a lot of thought before investing. So without waiting any longer, let’s quickly go through the tips which can help us is sorting our investment vows. This means have a diversified portfolio. Keep the diversification in terms of sectors that you invest in, keep a mix of equity and debt portfolio. Try having a systematic and well thought portfolio. Not all your investments can turn into wrong decisions. Diversification is the key to wealth generation. If you see the trend, neither stock market, nor the commodities like gold, silver, or oil and even Real Estate have given negative returns over a very long period of time. Yes trading and short term investment can be risky but can be rewarding as well. But if you are a safe player, always try to go long term. Buy it and forget it. Try to invest in sectors or commodities or investment options which are not faring well over a long period of time. In such sectors, the probability of upward movement is way more than downward movement. Also such sectors can give you a better ROI than the sector which are already doing good. Food for Thought: What is your opinion on Crude Oil Prices? At current levels, how much upside do you see and how much downside do you see? A good, thorough thought and an even better research will provide you a conclusion. You may share your thoughts here if you like. You have put in a lot of research and thinking before investing in a particular investment option. Have patience and let your investments grow. Don’t lose your wits just because things are not moving. Things take their own time to shape up. But this does not mean keep yourself invested in a wrong investment which might go down and never come up. Taking the previous point further, how will you know which investment can turn bad? Well to answer this, simply keep yourself updated with the financial world around you and try increasing your financial knowledge. REMEMBER Knowledge is power. Gaining knowledge about any subject will help you become an expert in that field. Think if you are an expert in the financial domain, you can always make right, informed decisions and that can actually help you in wealth creation. Why look for tips? Why not learn something new every day? Tell us if you find any difficulty, I assure you TradeTalk will always be there to help you out. 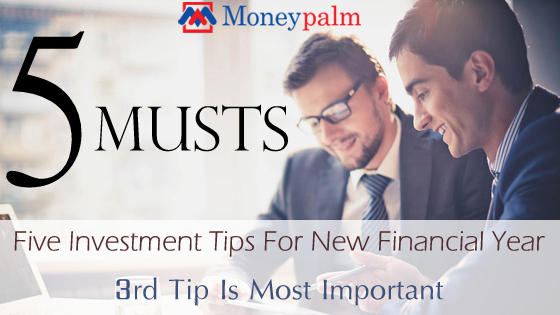 We hope the above tips will help you in taking correct financial decisions. Again a very happy Financial New Year, Indian New Year and Navratras to all of you. May you have an extremely successful year financially and otherwise starting these Navratras. God bless you all. Happy Investing and Happy Learning.